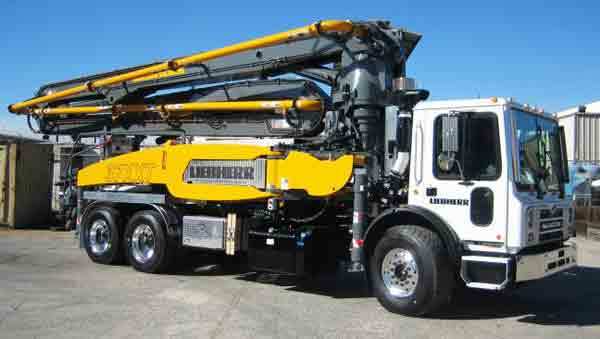 Liebherr concrete pumps are now available in Canada through Liebherr Canada Ltd. With a head office in Burlington, Ontario, and ten additional branches around Canada, Liebherr Canada Ltd offers reliable customer service and prompt spare parts availability. Customers can expect robust and durable concrete pumps which are developed and produced in Germany and are equipped exclusively with quality components from renowned manufacturers. Liebherr truck-mounted concrete pumps are available with booms sizes of 24 - 50 m and come in innovative Z, R or M-fold designs. Primarily the 41 meter truck mounted concrete pump is destined for the Canadian market and other models such as the 50 m pump are following soon. The boom is extremely torsion resistant, ensuring that vibrations are reduced to an absolute minimum when unfolding at the construction site. To ensure a balanced weight distribution, the concrete pipeline is configured close to the boom on both left and right hand sides. An array of design features has been introduced to simplify the replacement of wear parts for ease of servicing. The patented XXT narrow support is designed for low torsion and is extremely robust. The front and rear outriggers are secured directly onto the boom pedestal of the distributor boom, ensuring that all forces are channeled directly into the outriggers and not into the truck chassis frame. Four pivoting outriggers guarantee maximum flexibility and an extremely wide swing range of the distributor boom when working in a narrow configuration. This can prove significant when working on building sites with limited access. The pump cell units come in capacities from 66 – 167 m3/h and showing a remarkable smooth pumping performance even for extreme stiff concrete types. More pump cell options and many more optional accessories and equipment are available. 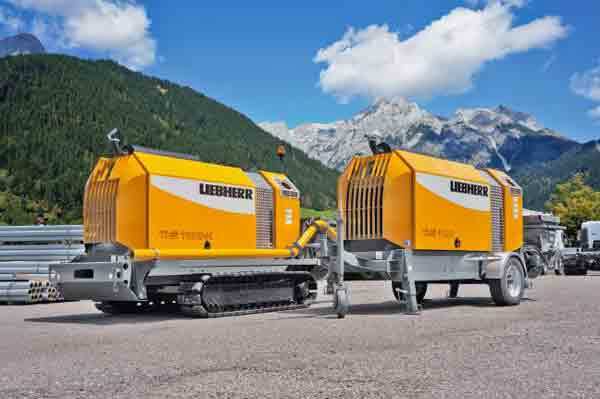 In addition to truck mounted concrete pumps, Liebherr Canada Ltd will also distribute stationary concrete pumps from Liebherr which are available as trailer and as crawler pumps with outputs ranging from 71 to 135 m3/h.